Don't let an aging network slow your business down. 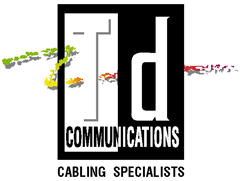 Td Communications offers a wide variety of cabling services designed to enhance and secure your voice and data networks. Cabling has changed over the years and Td Communications remains up to date on all new technological advances in the industry. Learn more about the history of cabling and how we can help your business. Take your business to the next level with network cabling by Td Communications. We handle everything from installing fiber optic cable to building server rooms. Since 1988, our staff has provided companies in the Bay Area with everything needed for a complete cabling infrastructure. This includes cables, jacks, patch panels, and voice fields. We also provide and install open racks, server cabinets, cable sleeves, and cable ladders. We are licensed by the state of California, bonded, and are members of BICSI. Our techs are trained in all of the top products, we use the latest equipment, and stay on top of current standards. Our manufactures sponsor classes to train and certify our techs. At Td Communications, we pride ourselves in doing work in a timely, clean, and professional manner. We even bring in our own vacuums to clean up after every job. You'll never even know we were there! "When you're Wells Fargo you can't afford to take risks with cabling. Td Communications nails it every time".